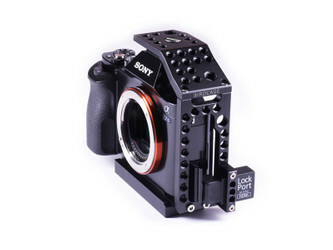 The BirdCage is an innovative cage design for the latest mirrorless Lumix GH4 and Sony A7 Series cameras with the incredible weight of 51 grams (1.79 oz.). 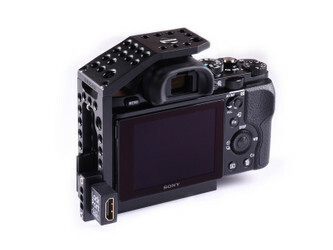 A "feather-light cage like a camera glove" was the main concept in the creative and engineering process, because now powerful cameras with 4K features are incredibly small and lightweight, and most cages on the market have more weight than the camera itself! 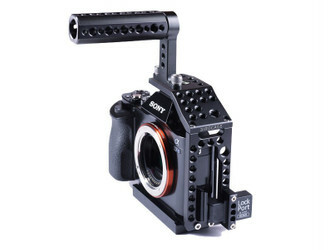 Designed for comfortable grip and action, with all the production accessories mounted on the the left side of the camera. The BirdCage is at the center of what we call Modular Production System. 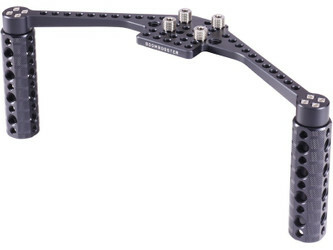 BirdCage integrates the popular LockPort (micro to full-size HDMI port saver), and a system of plates for different set-up's and Positive-Lock Mounts (EF and F Mount lenses don’t rotate when mounting, but just the internal mounting bayonet) for precise follow-focus work without annoying lens play on the bayonet mounts. The "monolithic" mount concept is also available for the popular MetaBones mount adapters adding "rock-solid" tough mounting with the BirdCage MetaPlate. 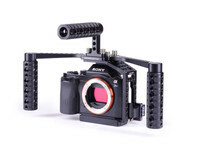 Camera mounting has totally improved with several double sized threads and also camera balancing improved a lot. 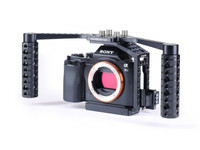 Additionally for the Lumix GH4, a special BirdCage GH4 Swivel is also available for total action of the camera LCD.